Devoted to the Systematic Exposition of the Science of Being, with Directions for its Practical Demonstration and Composed of Editorial Matter Only / A Monthly Magazine devoted to the Systematic Exposition of the Science of Being and to the Leading Questions of the New Thought Movement. 1/1, October 1895-December 1904, 16-36 pp., $1.00 a year. The issue for September 1899 in the Library of Congress notes "last published, absorbed by Mind." It was not published for most of 1900 and 1901 because, as the editor said, she was on "vacation," and then seems to have resumed publication with the move to Chicago, though Gestefeld remained in New York. Gestefeld (1845-1921) was a journalist and early Christian Science convert who broke with Mary Baker Eddy in 1888 (publishing Jesuitism in Christian Science in Chicago in that year). She then went on to be a prolific New Thought lecturer, at first before her Exodus Club ($25 a year dues) and then her Church of the New Thought. She called her system "Science of Being" and its organ was The Exodus. Gestefeld also was a Theosophist, and replied strongly (in The Path, February 1892) to an attack on her Science of Being as a form of Black Magic. She was a passionate feminist and contributed to The Woman’s Bible (1895). 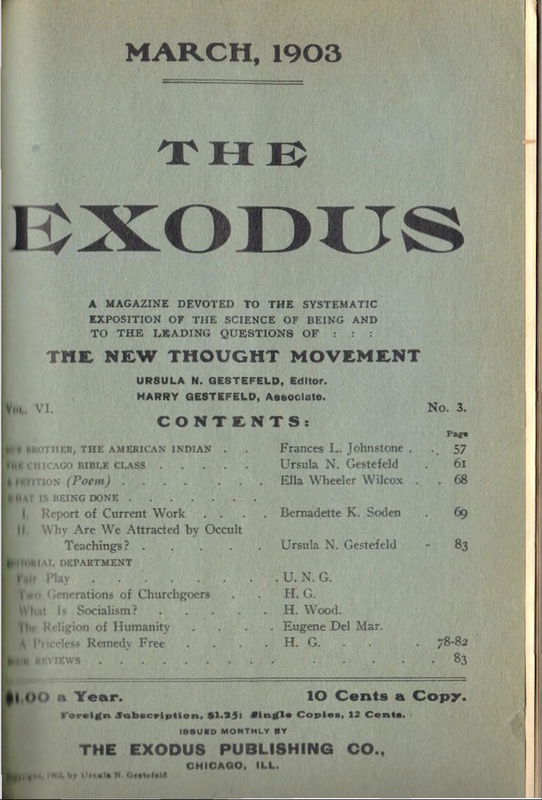 While the original journal, published from New York, was almost entirely written by Gestefeld and devoted to her lessons, International Bible Lessons, and club notes, the journal after its revival in Chicago included contributions by Ella Wheeler Wilcox, Henry Wood, Eugene Del Mar, and others. She was notable among reformers / spiritualists / New Thought advocates for denouncing socialism as a form of materialism that attempts to impose unselfishness and brotherly love without regard to the essential personal change. 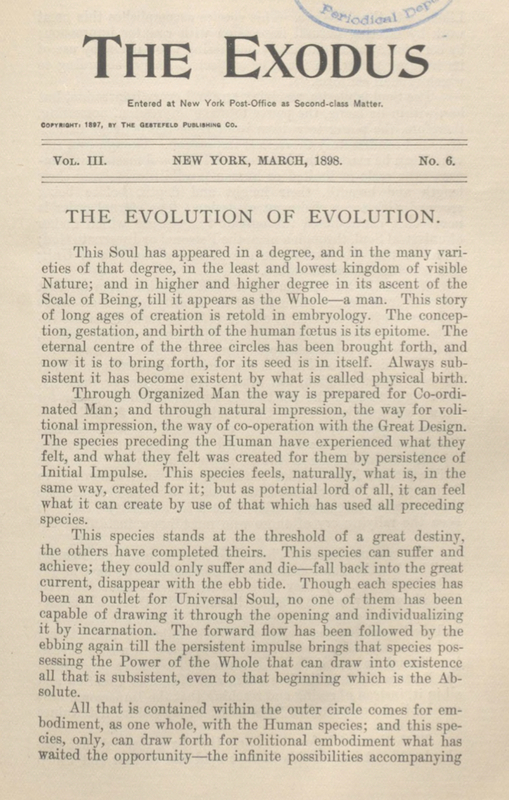 The journal in its early years devoted considerable attention to the question of reincarnation, which Gestefeld connected with the formation during this life of the "invisible body" (like jelly set in a mold) that is the "embodiment of self-consciousness" and that can survive the death of the body. Chicago History Museum; University of North Carolina; LOC.